In recent Soniccouture instruments you will find a feature called ‘Focus’ – unique to SC, this is an extremely useful way of working with larger collections of related but different single samples; drum sounds in Konkrete 3, field recordings in Geosonics and now hits and one shots in Attic: Synthi AKS (coming soon). As instruments designers, we had always been niggled by a certain issue: how to present a collection of single samples in a usable way? As instruments designers, we had always been niggled by a certain issue: how to present a collection of single samples in a usable way? 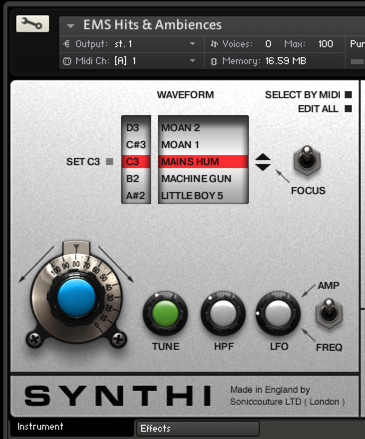 Historically, developers only really had one choice – to make one patch or instrument for each single sample,with it stretched over the keyrange, centred on C3 ready for playing. This is functional enough for the single sound, but presents the big problem of having to load a new patch to audition the next single sample. In a collection of 200 or 300 (or more) samples this would make the exercise of stepping through looking for inspiration very long-winded, and in many cases, totally off-putting. I suspect that this had the knock-on negative effect of devaluing sample libraries composed solely of one-shot samples in the minds of the users. People are understandably not so happy to pay much for a more or less unsorted mass of samples, even if they are broken down into folders etc – the end product inevitably lacks cohesion and smooth work-flow. Which is why I breathed a sigh of relief the day that Dan told me about his ‘Focus’ idea. Suddenly all those product ideas we had previously dismissed because we didn’t like to present endless single-sample patches became viable again. 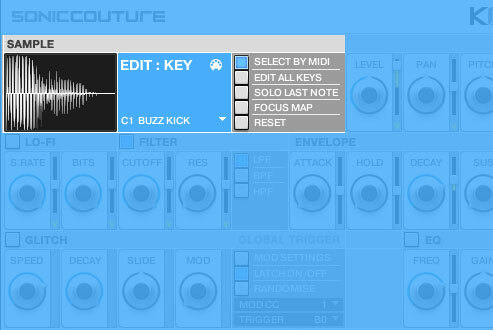 A Soniccouture Focus instrument is a large collection of single samples presented on the MIDI keyboard, mapped to one single key each. So, as you play each key you hear a different sound. Very easy. If you find a sound you like and want to use, just hit the ‘FOCUS’ button and that sound is automatically mapped across the entire width of the keyboard, tuned chromatically and centred on C3. Just the way you like it (probably). All the other sounds are no longer audible, unless you turn ‘FOCUS’ off again. You can edit all, or just one, of the samples at once. And that’s it – a simple solution that has really revolutionised how we design products based around single samples. Geosonics, for example, would not be nearly as simple to navigate without it; either the user would have to listen through 10+ minutes of field recording for each patch, or we would have had to present each recording as 50 to 100 different excerpts, in the old-fashioned long list. In Konkrete 3 its function is subtly different – because the single sounds are already organised and presented as drum kits, Focus operates more as an ‘instrumentizer’ – you can instantly make a melodic, tuned patch out of any single percussion sample, and play a bassline or lead. I’m excited all over again by Focus and its possibilities as we come to the end of working on the somewhat epic Project Attic. A venerable old SC product, Synthi AKS, has had a major refurb and update, and has really been brought to life by Focus technology. Part of the original Synthi product was a collection of one shot effects and hits made by patching the famous ‘pin-matrix’ of modulation routings on the original unit. This is not really suited to multi-sampling or any 21st century ‘deep-sampling’ treatments; it’s just about very cool individual sounds that often only happen once, such is the unpredictability of the E.M.S. machine. Here we were able to gather together the most characterful sounds of the Synthi and put them all into one Kontakt instrument, where they can be played one key at a time as a kind of mad all-in-one Doctor Who patch, or then converted instantly to very playable tuned patches with Focus mode. Look out for the new Synthi AKS ( in The Attic) coming Q1 2014.